Writers just starting out on their writing journey are fascinated by why an author chose to write about a particular topic. When we hold a published book in all its hardback glory, and pore over the Acknowledgements, and the table of contents, and then the writing itself, it’s hard to imagine that this book was a mere wisp floating around the world when it flew over an author who netted it, and brought it close to herself and examined it with a magnifying glass, and held it in her head and her heart, till it grew into the book we hold today, in all its hardback glory. As I read (I LOVE her) Gretchen Rubin’s wonderful book on habits, Better Then Before: Mastering the Habits of our Everyday Lives, I was enthralled by her depiction of how she came to explore this topic for her new book. As a writer, my great interest is human nature, and in particular, the subject of happiness. A few years ago, I noticed a pattern: when people told me about a “before and after” change they’d made that boosted their happiness, they often pointed to the formation of a crucial habit. And when they were unhappy about a change they’d failed to make, that too often related to a habit. Then one day, when I was having lunch with an old friend, she said something that turned my casual interest in habits into a full-time preoccupation. “Why?” I echoed, as I mentally flipped through my index cards of happiness research to find some relevant insight or useful observation. Nothing. Our conversation shifted to other topics, but as the days passed, I couldn’t get this exchange out of my mind. Same person, same activity, different habit. Why? Why had she been able to exercise faithfully in the past, but not now? How might she start again? Her question buzzed in my head with the special energy that tells me I’ve stumbled onto something important. Finally, I connected that conversation with what I’d noticed about people’s accounts of their before-and-after transformations, and it struck me: To understand how people are able to change, I must understand habits. I felt the sense of joyous anticipation and relief that I feel every time I get the idea for my next book. It was obvious! Habits. A chance conversation led to this wonderful book that contains practical advice that can help people like you and me live better. A wisp from the conversation, an unanswered question, that absorbed Gretchen for years. A question she held close to her head, and to her heart. Why is often the seedbed from which ideas grow. 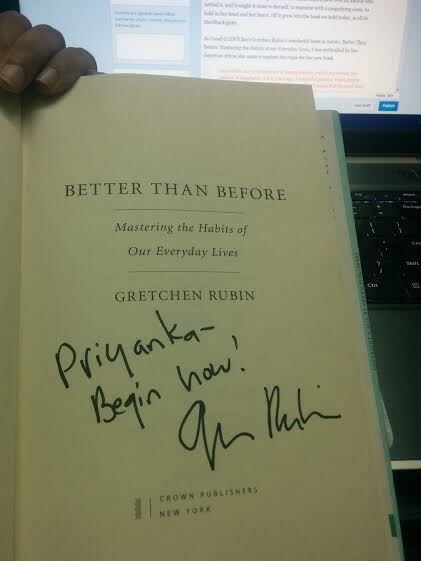 Here’s my signed copy that my sister got signed for me in California and sent through my friend all the way to Delhi! Yay! Would your words change if you draw the letters by hand, instead of type them?